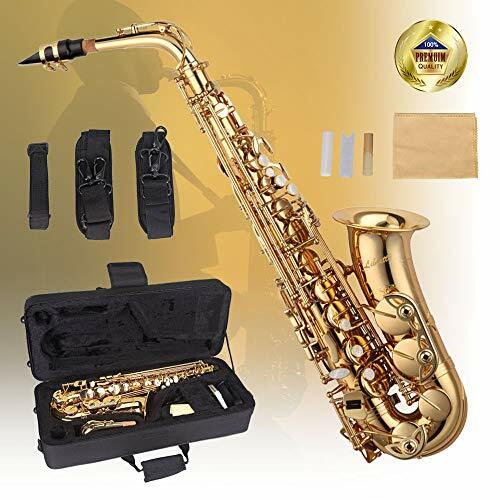 Libretto Gold Lacquer Eb Alto Saxophone with Durable Canvas Case! Made Exclusively by Stage Rocker, Made in Taiwan! Libretto is a brand aiming to make the musical instruments more attainable to every music lovers, especially for entry levels. We aspire to bring the benefits of music to many more of people who are/ will be on the way to their music career. With a focus on quality craftsmanship, we assure all instruments are well-built and all players may enjoy the pleasure of music without any obstacles. Quality are always our major focus. Buy one and start your musical career with us! Note: Light shooting and different displays may cause the color of the item in the picture a little different from the real object. The measurement allowed error. ☑ Made exclusively by Stage Rocker, Made in Taiwan! ☑ Gold lacquered with high F# key (key layout may be different), Quality leather pads, Extensive Hand Engraving and Hand Key Adjustment! ☑ Includes: Durable canvas case, Mouthpiece, Neck strap, Reed, Cleaning cloth & More! ☑ Long lasting with beautiful tones! Precise intonation, quick response, and a big sound! ☑ Suitable for beginners, students, and Saxophone lovers!